CookieCon 2017 is just a memory now, but I wanted to be sure and share with you about the Pre-CC classes that were offered at CookieCon, and also share the cookies I made specifically for all the events. (For a summary of the general convention, check out this blog post. Pre--CookieCon classes were originally created at the CookieCon event in September 2015. You can read about the adventures that happened at that event HERE. 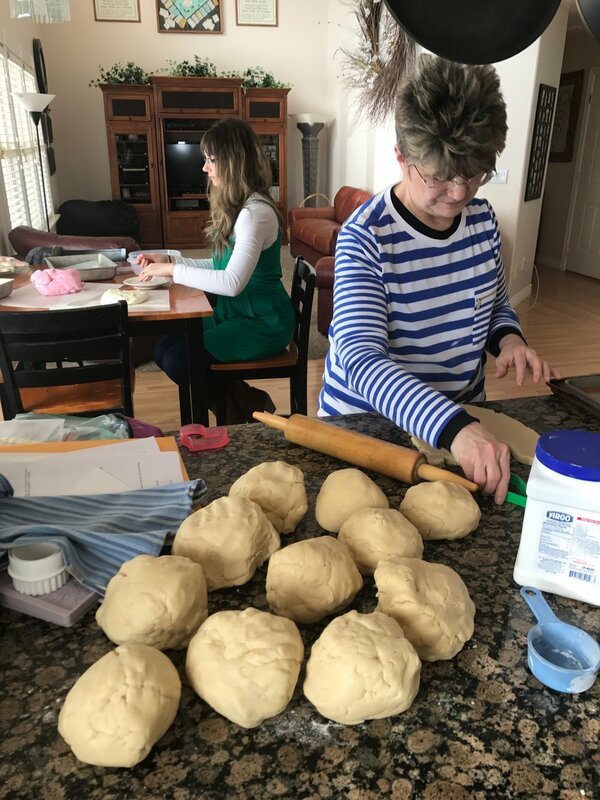 This year's CookieCrazie classes included two Going Rustic classes on Wednesday and one Adding Shabby to the Chic class on Thursday morning. (Here's a blog post with class descriptions). All of these classes happened before the actual CookieCon festivities began on Thursday afternoon. 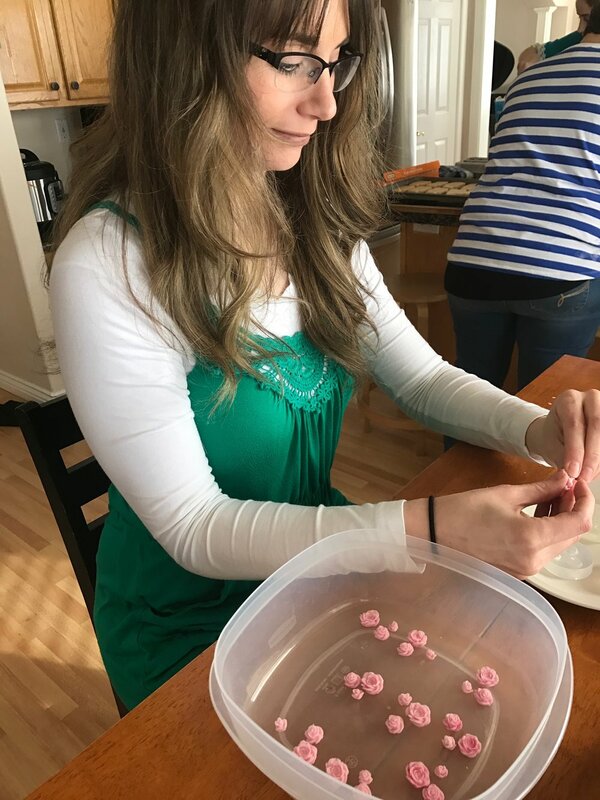 The preparations for these classes can be overwhelming, but thankfully I had some WONDERFUL friends that pitched in and made the prep fast, easy, and fun. :) Plus, I got to go to Salt Lake City early and see a freshly fallen snow. It was gorgeous! Lisa Provenza-Bebar was my helper for the classes, and she is amazing! Even facing a personal crisis in her life, she was determined to fulfill her commitment to me and did it with over-the-top effort. I appreciate her so much. I definitely couldn't have done this without her! After spending many many hours getting everything ready for the classes (especially overnight on Tuesday! ), it was all worth it when each class filled up with eager cookiers that wanted to learn and experience all they could. I enjoyed teaching them so much.....and I'm extremely grateful they put their confidence in me and invested in my classes. In the end, I believe everyone went away learning several new things.....and many expressed some "aHA" moments where they acquired some skills or tips that will transform their decorating. I enjoyed every second of this decorating experience. So once classes were over, CookieCon began. I kind of felt like I was now on vacation. NICE! I brought several cookies to enter into the Sugar Show.....and then other cookies to give away. My main Sugar Show entry was in the Food & Beverage category. For the Cookie Town, I created two entries....a Sweet Shop and a cute brick house. Everyone at CookieCon received custom cutters made exclusively for Cookie Con by Ann Clark Cutters. Several of us were asked to make our own versions of these two cutters for AC to have on their website before the participants even knew they were getting them. Here's two sets I came up. I made some burlap BG hearts for all my students to enjoy. And I made some fun tag cookies to share with friends. CookieCon 2017 was a joy.....and I'm so thrilled that I could participate in many of the events. I highly recommend going in September 2018! My mind is still reeling from the adventures of last weekend's CookieCon 2017. It would be impossible for me to give you a complete overview of the event, but I wanted to at least highlight a few of the experiences and people that made it a very special memory. This year's CookieCon marks the fourth event of its kind. I have had the privilege of being at each one.....and I can honestly say after each event that it gets better and better. 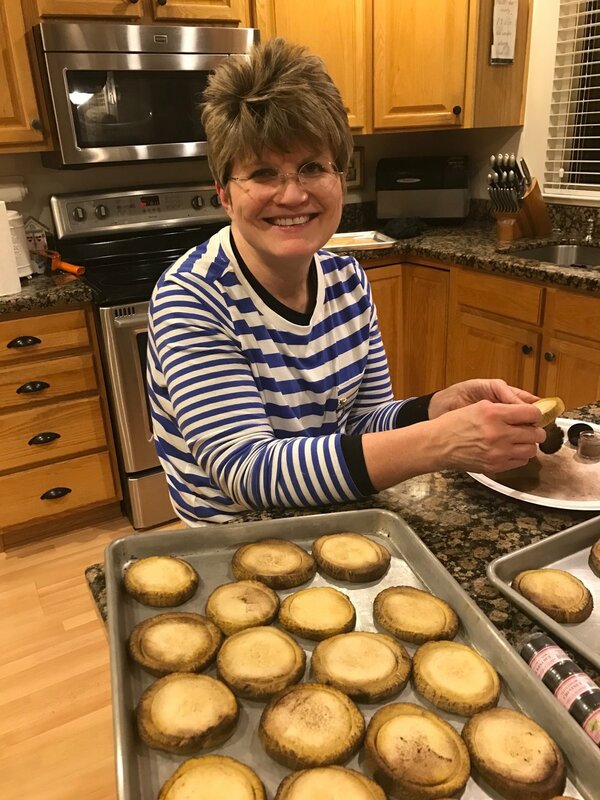 Mike & Karen Summers (Karen's Cookies) really know how to pull together 500 cookie decorating lovers and allow them to experience lots of inspiration, instruction, and sweet relationships. Now that I'm home and have had a couple of days to process it all, let me share lots of photos and a little of my perspective. 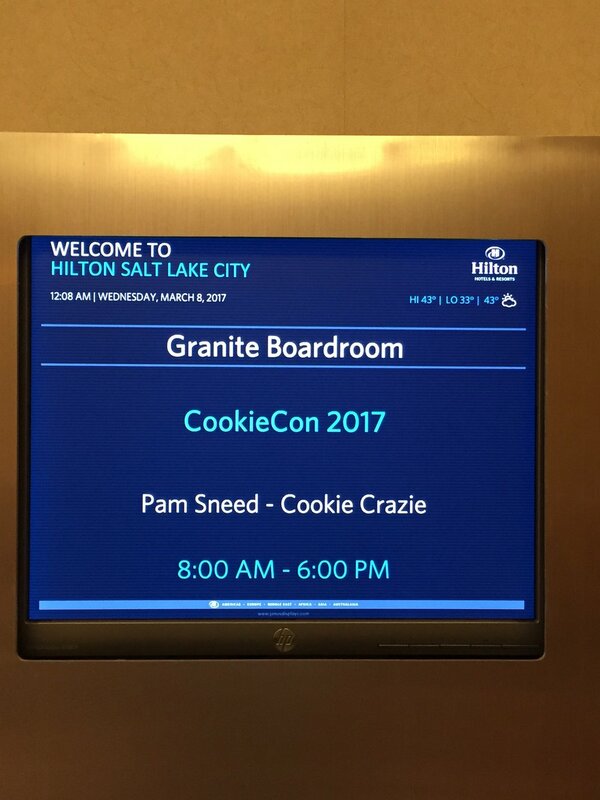 I arrived in Salt Lake City a few days early in order to prepare for my pre-CookieCon classes. I'll write more about that later.....but for now, I'll just say that those classes were weighing pretty heavy on my mind, and all I could think about were my students and making sure they had the best experience possible. Once that huge portion of my week was complete, I could relax and enjoy being with friends (old & new), and soaking up all that CookieCon 2017 had to offer. CookieCon began when Mike & Karen took to the stage in the huge ballroom and delighted us with an evening focusing on how cookies make such a huge difference. Katy Metoyer (Sugar Dayne) was the keynote speaker.....and she truly spoke straight to our hearts about how "My Cookie Friends are Real". The Sugar Show is always a highlight of the weekend. 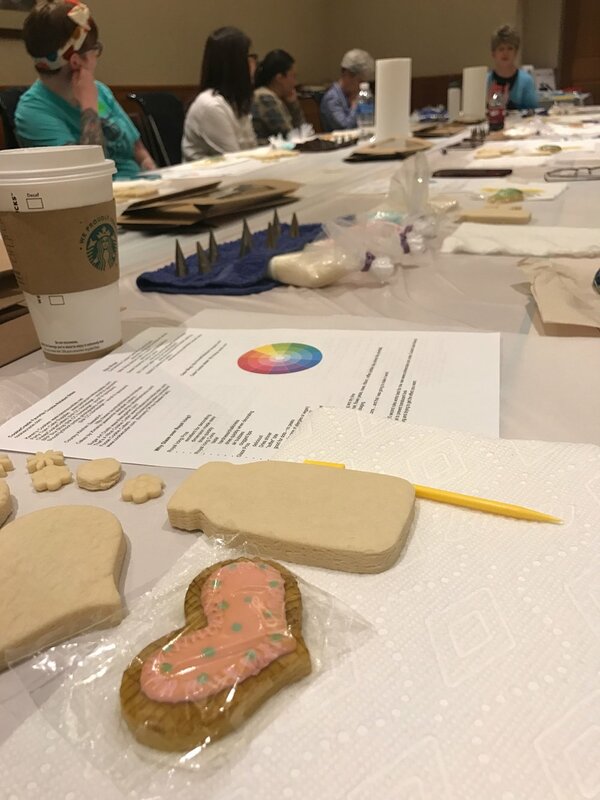 To see everyone pour their heart and soul into a cookie (or a set of cookies) and then display them all together in one wonderful-smelling-room was overwhelming in a good kind of way. The categories were "Anything Goes", "Cinema", and "Food & Beverage". Here's just a sampling of the fabulous cookies to be found there. Also in the Sugar Show room, there was Cookie Town. Wow! It was a collaboration by not only cookiers attending the show, but also any others that wanted to submit an entry but couldn't be there. It was AMAZING! There was truly a little bit of every structure you can imagine. Everyone was mesmerized as they walked along it's "streets". There were so many entries that it was easy to miss some with each pass. Here's a sampling of some of my favorites. Seven classes were offered to participants on Friday. It was a whirlwind day going from class to class to class. My favorite class was Angela Nino's on watercolor roses and wafer paper roses. The subject was so unique and fascinating to hear about. And the fact that it was her first time to teach and she did such a great job was very impressive. It's such a unique experience to be in the huge ballroom with every medium possible to decorate a cookie. Plus, you are surrounded by fellow cookiers that share your passion. I just walked around the room and marveled at people's creativity. During open decorating, each cookier is given a mystery shape to decorated. 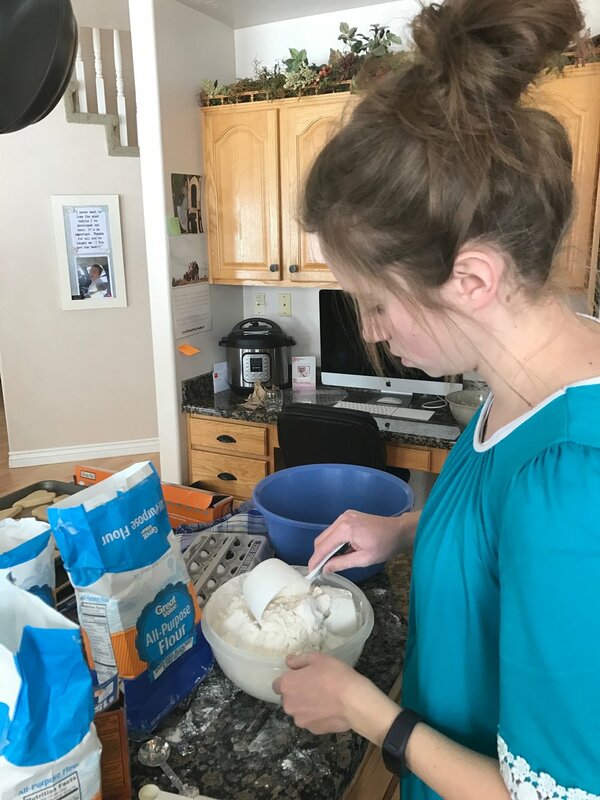 They have a few hours to create a cookie that is entered into the final sugar show competition. But this one is different in that the decorator is coming up with the design and then executing it in a challenging time-frame and environment.....albeit super stocked with every cookie medium and tool possible. Look at these designs done on a fox-shaped cookie! But hands down the best part of CookieCon is the relationships that are renewed and cultivated, and those that come to life for the first time. Truly the sweet friends I've made at these events are some of my dearest ones. Mike & Karen work long and hard for 18+ months to bring this incredible opportunity to us. friends helping and supporting others and enhancing the world with cookies.